We love having a babysitter. I think it’s important to our relationship and our lives to get out of the house without Ruby from time to time, and it’s good for Ruby to be able to thrive without us (and know she can). Plus, a babysitter offers a kind of active, engaged play that us busy parents can’t always provide. I can’t stress enough to new parents that you should get a babysitter at least semi-regularly. Several different people babysit Ruby (from old friends to people in our parents group to a teenage babysitter). 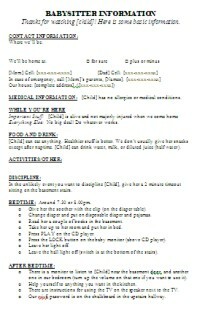 To make things easy for them and us, I created a little information sheet that I fill out and leave on the table (next to the phone and a pen) whenever we go out. It has important info like our address and contact details, plus things like Ruby’s bedtime routine. It has empty spaces for where we’re going, when we’ll be back, and additional info. I keep a few of these sheets in a drawer so they’re ready to go at a moment’s notice. It frees the babysitter from having to scrupulously remember everything we quickly chatter on the way out the door. It occurred to me that the sheet might be useful for others, so I created a template in Microsoft Word that you can download and use. Just replace everything in brackets with your information (e.g., changing [Child] to Ruby), and customize for your child’s needs. Thanks for sharing this. I’m adjusting it right now to apply to a pet/house sitter!